Animal rights groups have accused impeached South Korean leader Park Geun-hye of abandoning her dogs when she left the presidential palace. The row comes as Ms Park was called for questioning and named as a suspect in the wide-ranging corruption scandal that eventually led to her downfall. She was dismissed from her post last week when the constitutional court upheld her impeachment. The palace says the dogs will be cared for and possibly given new homes. She is the country’s first democratically elected leader to be ousted. Over the weekend Ms Park left the presidential palace, known as the Cheong Wa Dae, and moved into her house in an affluent district of Seoul. 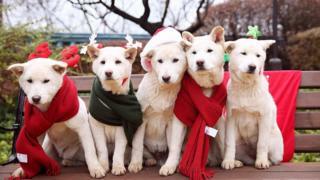 Her nine Jindo dogs were not among the entourage that accompanied her. The Busan Korea Alliance for the Prevention of Cruelty to Animals (Busan Kapca) noted she could have violated animal protection laws by leaving the dogs behind. The group, along with the Coexistence of Animal Rights on Earth (Care), claimed she had abandoned her pets, and both organisations offered to find new homes for the dogs. A Cheong Wa Dae spokesman denied she had abandoned her dogs, and told Reuters that they were left at the palace partly because it would not be good for them to be uprooted from their home. Ms Park was known to be fond of her pets, which had been dubbed the country’s “First Dogs,” reported Korea Times. When Ms Park was inaugurated as president in 2013, she moved into Cheong Wa Dae with a pair of Jindo dogs who were given to her as a present. Ms Park meanwhile has been summoned by prosecutors for questioning over her alleged involvement in the corruption scandal surrounding presidential aide Choi Soon-sil. She is accused of colluding with Ms Choi in extorting large amounts of money and favours from conglomerates. Ms Park has denied all accusations and refused previous requests to take part in investigations. But without her presidential immunity, she may be forced to attend questioning if she refuses the summons this time round, reported Yonhap news agency. On Friday, the Constitutional Court ruled Ms Park’s actions “seriously impaired the spirit of… democracy and the rule of law”.